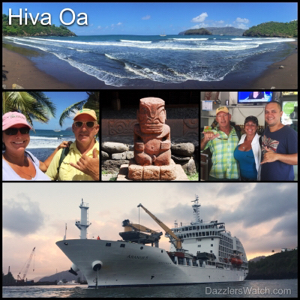 The sight of Hiva Oa was truly awesome. 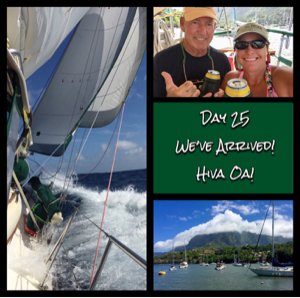 We are anchored at the only anchorage on the southern side of the island. It’s called Tahuaku Bay. There’s a tiny little boatyard and a Mobil station at the docks. The anchorage is crowded with cruisers who have made the jump across the Pacific. Some came from México, others from Panama and the Galapagos and several came all the way from Europe. We know a few of the cruisers and as I told you in our last entry, we received quite the royal welcome from them. In addition to the delicious treats and ferry rides we received from SV Boo’s Blue 2 and SV Dash, we also were quite surprised to be treated to sundowners and a dinner of fresh tuna and ceviché on board SV SuAn with our friends Lutz and Gabby. Yes, it was quite a way to end a long trip. The village of Atuona is small and very quaint. There’s only about two thousand people living on the entire island and most of them live in or just near Atuona. The local people here are truly amazing! They are so friendly and welcoming. The village is about a 2.5 mile hike up the steep mountain on a windy road and all the cruisers hitchhike. Yes, we hitchhiked. It was a first for me but it was pretty cool. We offered money to everyone who picked us up but none would accept. Due to the language barrier we struggled a bit to have a conversation with several of these great people but there were lots of smiles and “merci’s” going on. I immediately noticed how very clean this place is and there aren’t stray dogs running all over the place. It’s definitely quite a change from México. And, of course, everything is so green and lush, not dry and brown. With the lush forest comes that wonderful, fresh smell of dirt and foliage. That’s something I’ve missed for a very long time. It’s simply beautiful here. Of course, everything cannot be perfect, even here in paradise. After a very long first day we arrived back on Dazzler, started up the generator and after a moment or two it seized up. Yep, our main source for supplemental power is now gone! Fortunately we can use the engine but it’s certainly not how we wanted to start our stay here. Dan was pretty calm about it. After all, she’s ten years old and for something like that to last as long as it did in the salt air, it’s pretty impressive. Looks like we will be looking for another in Papeeté. Well, you know the ol’ saying… B.O.A.T….Break Out Another Thousand! Being in port is wonderful and a nice change from the past twenty-five days. It is nice to get back to our normal morning routine of sitting around the table, having coffee and planning the day’s adventure. The first item on the agenda is a trip into town to see the tattoo guy. In my whole life I never dreamed I’d get one of those things but it’s sort of a right of passage thing. Many, many cruisers get Polynesian tattoos to memorialize a successful journey across the sea. We’ve thought long and hard about this and have studied them quite a bit. We’re excited to celebrate our accomplishment in the way of the Polynesian people do. Our first couple days have been somewhat of a blur. It’s funny how you go from sailing the vast ocean at a snail’s pace to the “hustle & bustle” of the village life. Having so many friends here means there is always something to do. We are all getting together, having sundowners on each other’s boats, lunches and dinners in town and planning the next legs of our journeys. Some of the cruisers have crew on board that must be dropped in Tahiti at the airport so they are rushing a bit more than others and of course, most of us only have a 90 day visa so we really don’t want to let much grass grow under our feet. Unfortunately we are stuck here for a few extra days because we are waiting for our duty free fuel certificate. Fuel is pretty expensive down here so you take every break you can get. We spend a few afternoons at Make Make. It’s one of the only restaurants in town and they have free Wifi. After weeks without internet it’s nice to catch up a little on world events. Marc at Make Make is a great guy. He helps us with our French and we teach him a little Spanish and English. They make an awesome fish burger here and the beer is cold. The local beer is Hinano. It’s pretty tasty but at $5 a bottle you don’t drink much when you are out. Yes, things are considerably more expensive here than in México but we both feel like they are not as bad as everyone says. After all, you can spend $5 on a beer in Florida or California too. Note: Make Make is closed on Saturdays & Sundays. Yep, it was a bummer but we made do. We bought some rotisserie chicken from a lady on the street, picked up a six pack of beer at the little store and headed to the park along the black sand beach of Atuona Bay. Four of our friends joined us. It was a lovely afternoon. After lunch we all went our separate ways. We take a long walk along the beach then head back to Make Make…Our friends are sitting around on the steps utilizing the internet. Even though they are closed we can still get WiFi. We all take the time to check out Facebook, bank accounts, blogs and emails. After an hour or so everyone splits again. Dan and I start to head back to the anchorage. This time, however, we will not be so lucky to get a ride. It seems the entire village shuts down at 2:00 p.m on a Saturday so there literally are no cars! It’s going to be a very long, hot walk! An hour later we arrive at the dingy dock and I’m ready to get back on the boat and have a frosty cold beer. Of course that’s after I put on my suit and hose myself down. We spend the afternoon relaxing in the cockpit and watching these three people on SV Ella try to put their jib back on the roller furling. It was almost as entertaining as sitting at a boat ramp watching people try to launch their boats. Oh yeah, a couple of cold ones and free entertainment…nice! On Mondays the supply ship arrives at the anchorage. The Aranui is a pretty big ship to come into this little anchorage and she creates quite a stir. They arrive early in the morning and you better be out of their way! We moved just outside of the anchorage the night before so we would be out of the way. There are yellow marks on the docks and across the bay on the rocks that show the line you must be behind but many pay no attention to them. At least they didn’t until they received an early morning greeting from her tender boat. With so many boats in the anchorage it was a little chaotic with everyone juxtaposing for the perfect position. The Aranui stayed in port the entire day. We moved inside the anchorage after they docked and had an amazing view of them as they departed. Got to give it to the Captain of that ship. He or she moved that thing around in there like it was nothing. I was really impressed! Now that she is gone boats that arrived throughout the day have come pouring into the anchorage. Sometimes I wonder what people are thinking out here. Several boats have been hit because either they were anchored incorrectly or they just don’t know how to maneuver their vessel. We were almost hit by a French flagged vessel named SV Kirwit. Their stern anchor was dragging and the captain was on shore. His wife and son knew nothing about the boat so Dan had to go out on our dink and move it. When the captain arrived back they left the anchorage. Throughout the entire situation I was taking pictures and videos in the event he hit us. The next morning he came back into the anchorage and anchored on our port side. When Dan arrived back from getting fuel he came over to speak to him. He said that it is illegal for me to take photos of them without their consent. Dan explained why I was doing it and he just kept telling him it was illegal in French territories. He tried to make himself out as some serious captain. We both know better. He didn’t even have chain on his stern anchor AND it was several fifty foot sections of line that were linked together with bowline knots. Before we left I did speak to our agent at Tahiti Crew who informed me that it is not, in fact, illegal to take a photo of someone here without permission. Guess the Frenchman was lying about more than just his seamanship skills. Hmmmmm. Looking forward to getting out of this anchorage and on to places that are not so crowded!